ITIL (the IT Infrastructure Library) is the most widely recognised IT Service Management qualification in use at the moment. It is accredited by the APMG (the same organisation that administers PRINCE2 and MSP), and is assessed through similar objective-testing examinations. There are four levels to the ITIL V3 qualification, each of which is attained by the completion of a certain number of modules or credits. Once a student has earned 22 credits, the ITIL V3 Diploma (or “ITIL Expert in IT Service Management”) is awarded. The ultimate tier of the qualification is ITIL Master, which is assessed through peer review, written examinations and case studies/simulations. This level requires substantial practical experience of IT Service Management. The Foundation module is standard and requisite for all ITIL V3 students. It is worth 2 credits, which are gained by passing the ITIL Foundation level examination. It is aimed at anybody who needs to have a basic awareness of what ITIL is, or who needs to gain a higher-level ITIL qualification – for example, individuals working within or alongside an IT Service Management environment. The Foundation exam contains 40 multiple choice questions, each offering the candidate four choices, only one of which is correct. The exam lasts for 60 minutes and is closed-book, so no course notes, manuals or other revision guides may be used. The candidate must score 26 correct answers (65%) in order to pass the exam. There are nine Intermediate level modules, each worth between 3 and 4 credits. A total of 15 credits must be earned in order to be eligible for the ITIL V3 Diploma. These credits may be earned through modules taken from either one of the main modular streams (the Service Lifecycle Series and the Service Capabilities Series), or through a combination of the two. There are five Service Lifecycle modules, each of which focuses on one stage of the Service Lifecycle (Strategy, Design, Transition, Operation, and Continual Service Improvement). The Service Capabilities Series contains four modules, each of which examines a cluster of role-based processes (for example: processes associated with Operational Support and Analysis). All credits are earned through attendance of approved training courses and passing the ITIL modular exams. All Intermediate level exams are 90 minutes long and consist of multiple choice questions divided into 8 main sections and based on Service Management scenarios. The pass mark for these exams is 70%, and answers are marked using gradient scoring (i.e. a = 2 marks, b = 1 mark, c = 0.5 marks, d = 0 marks). The Intermediate-level certificates are independent qualifications and are aimed at individuals who wish to deepen their understanding of particular elements within ITIL Service Management, or who need to gain the ITIL V3 Diploma. It is recommended, although not required, that a student has 2 years of related work experience and basic exposure to IT concepts before attempting the Intermediate-level courses. Once a student has gained 2 Foundation level credits and at least 15 Intermediate level credits, one final synoptic or normalizing module is compulsory in order to gain the ITIL V3 Diploma (or ‘ITIL Expert’). This module is worth 5 credits and is called ‘Managing Across the Lifecycle’. Managing Across the Lifecycle is designed to complement the Intermediate modules previously studied by each candidate, by providing the ancillary knowledge necessary for practical implementation of the Service Management theory within a business context. The examination for Managing Across the Lifecycle follows the same format as the other Intermediate level exams. 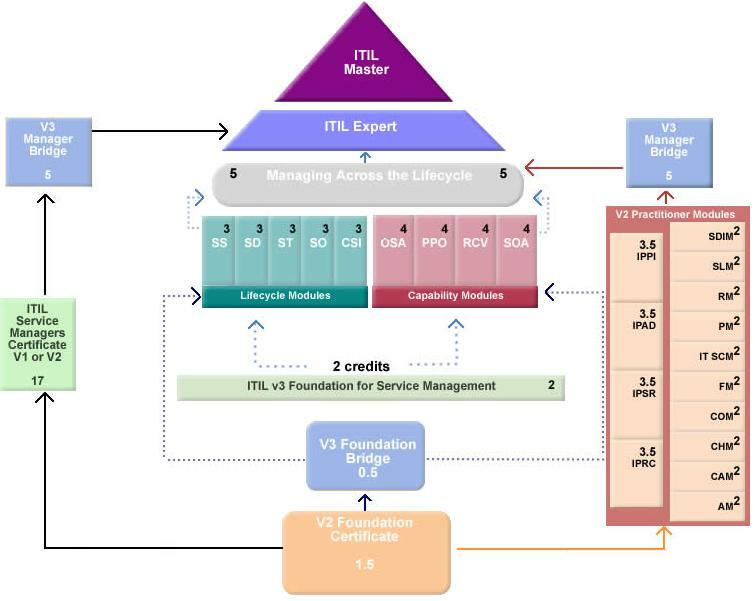 The ultimate tier of the ITIL Service Management qualification depends much more than the earlier layers on practical experience and individual expertise. Eligibility is assessed through peer evaluation, written exams, case studies and simulations. ITIL recommends that at least eight years experience in IT Service Management will be expected of all ITIL Masters. Information Technology: What Is ITIL? Pursuing the ITIL 2011 Foundation Certification.